At Pringle Creek Community, being sustainable is a way of life. We have been a leader in sustainable development since the beginning. And, we agree, that the LEED standard is a norm when it comes to building homes today. In Portland, builders are striving to attain LEED Platinum with the new standards that are in place. We are proud to have already achieved this status right in the heart of the Willamette Valley, Salem, Oregon. We have built the highest ranked home in Oregon. The Net Zero home is LEED Platinum certified with these new standards in place. Here’s to living more sustainably, with community, and also – with more style. For Portland developer Project^, sustainability is part of every development. Project^ is one of many local developers that still place value in environmental building certification programs even as energy codes and market expectations have raised the baseline, making nearly every project more energy efficient and environmentally responsible. For Project^, third-party certifications such as the U.S. Green Building Council’s Leadership in Energy and Environmental Design, better known as LEED, ensure that everyone on a project team, including the architects and contractors, keep sustainability goals at the forefront. The firm’s Field Office, a two-building, 300,000-square-foot complex in Northwest Portland, in October 2018 received a LEED platinum rating – the highest attainable. Project^ is pursuing a LEED gold rating for an addition and renovation of The Nature Conservancy’s offices in Southeast Portland. And Meyer Memorial Trust’s new headquarters in Albina will have a “high level of LEED certification,” Hallova said. Both projects include solar arrays. As developers, architects and contractors have made progress reaching basic levels of sustainability, the U.S. Green Building Council has repeatedly raised the bar, requiring projects to do more to meet the same rating levels. 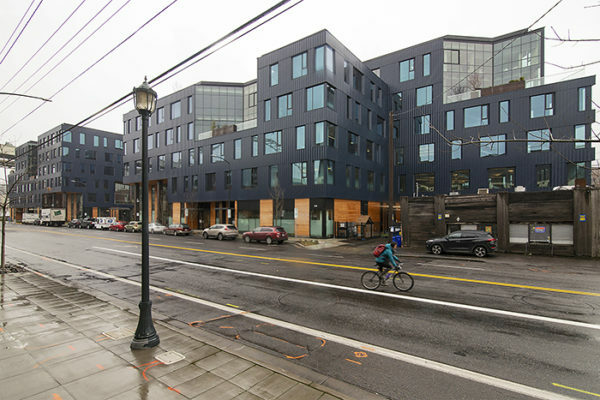 Mill Creek Residential Trust, a major developer based in Dallas, continues to use LEED for all of its Portland projects. Sam Rodriguez, the firm’s senior managing director in Portland, said it’s “not crazy expensive” to attain a basic LEED rating. Most recently, Mill Creek’s Modera Belmont in January received a LEED gold rating. Multifamily projects already must have high levels of energy efficiency, low levels of volatile organic compounds and recycling of construction materials to meet regulatory and market expectations, Rodriguez said. “A lot of it is already baked in, because either Portland requires it, or it’s something that’s already done by the local subcontractor community,” he said. Developers must balance cost when deciding which rating to pursue. Investors like to see a LEED rating to have some assurance as to building performance and energy efficiency, Rodriguez said. Renters like it too. A LEED rating does not command higher rents or sale prices when a building comes to market, Rodriguez said. LEED is hardly the only environmental building certification, and competitors have proliferated, including Green Globes, WELL Building and Earth Advantage. Green Globes and WELL Building have attracted governmental and other large institutional customers. In Oregon, 48 projects have been certified by Green Globes, most recently in 2017. Many of the certified projects are apartment buildings. WELL Building has five projects in Oregon, including three at Portland Community College. Earth Advantage, based in Portland, has gained some industry buy-in. Project^ is pursuing Earth Advantage platinum certification for its Origami townhomes project on North Vancouver Avenue. “We choose different certifications based on the size of the project,” Hallova said. Hallova expects to continue pursuing certifications for its new construction projects.